A little page depicting the design/ initial production dates of the TeleVue lineup. I have to smile just a bit that my most used EP's, the original Plossl and the Widefields are from the 1980-1984 introduction period. I also still love the original T1 Nagler 4.8mm and 7mm. Great lunar pieces. Me and my old out-of-date equipment. AbbN, j.gardavsky, not_Fritz_Argelander and 14 others like this. I only own the 1.25" 2.5x barlow, and a 4mm Radian, and a Paracorr I, but I would love to own more! Last edited by morrbru; 02-23-2019 at 08:02 PM. Reason: Forgot something! It took me many years, and a lot of waiting and watching of the classifieds, and maybe a little begging and pleading, but I finally built my collection from pre-owned pieces. At a tremendous savings also. One thing about pre-owned EP's of this nature is that they're almost always well cared for and in 'excellent' condition. j.gardavsky, sketrip and Bigzmey like this. I have one of the now discontinued TV Planetary filters. Everyone told me that TV don't know anything about filters and it was terribly overpriced. I bought it a couple of Mars oppositions ago but I only actually used it last year. The only filter I preferred to it was a Baader Orange. The TV filter was expensive, but it is very good. I'm familiar with their planetary filters, but never had the opportunity to try one myself. They had two different variations of these if I remember correctly. I think there was a Mars A and a B originally. By the time I bought mine they only marketed one filter as a general planetary. Mine's a bit pink, but it's great on Mars. Supposedly good on Jupiter as well. I may try it on Jupiter and Saturn this year. Tele Vue has a great legacy, and some of their eyepieces can't be simply replaced, like their Nagler 3mm - 6mm Zoom. and 9 eyepieces I bought as new. 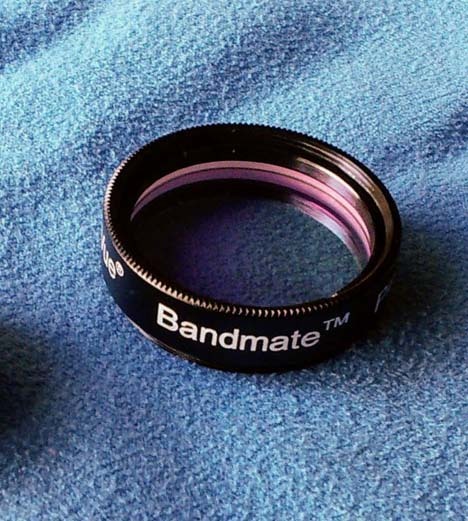 Take a UV lamp and illuminate your filter from above - not against your eyes. Most of your color filters will reveal a yellow or yellow/green fuorescent glow. all of them shining enough bright on the blue wavelengths to excite some fluorescence. I have noticed this contrast drop already before, that's why I have made the UV tests. The report will go on our Forum, as soon as we can post pics. which don't show the fluorescence. Sometimes, I am telling me, why nobody tests that stuff when writing reports on the other forums. dpickles55, DeanD, SpyderwerX and 2 others like this. Thank you JG. I'm really looking forward to your UV reports and results. I think I have around 40 total EPs currently, (only 20ish of these stay in the main case) and unless I'm not thinking of something, I do believe all of them are pre-owned pieces. And I totally agree, the 3-6 Nagler zoom is indeed one outstanding specialty EP. I jokingly refer to it as a "plossl partner" because of its constant 50° AFOV, and it fits in perfectly under the 7.4mm plossl. j.gardavsky and DeanD like this. counting all my eyepieces, also those in the socks drawers, it may be like yours 40, why should we care. DeanD, 10538, SpyderwerX and 1 others like this. Me and my old out-of-date equipment. I have a lot of old shop equipment that I really like (more than new stuff) I tell everyone "my old equipment already knows how to do it's job, so all I have to do my part"